Over in Flotsam & Jetsam, we’ve got the cover of an Unlikely Little Golden Book. It’s The Walking Dead! Head on over and check it out! Speaking of the dead, I bet you thought this site was among them, but here we are with new content… but in case we don’t check back in in the next couple of weeks, here’s a handy link back to our ol’ Christmas comedy section. 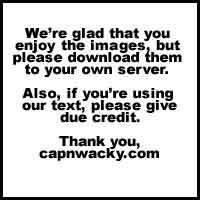 For lent, The Cap’n is giving up not updating this website! We’ve got a brand new entry in our Flotsam & Jetsam section: Super-Lent! Your favorite super-heroes tell us what they’re giving up for lent. Speaking of super-heroes. The Batman & Rockin’ series has wrapped up. you can see all of the bat-album covers here. All material on this site © 1999-2010 its respective authors.